Why Customer Support Is Important and How to Scale Customer Support for Startups? Have you ever wondered how to start a business when you are not sure your product would fit the market’s expectations? If you are an entrepreneur, then you most definitely have. No matter whether you are disrupting the market with innovative ideas or solving problems in your own unique way, finding the perfect strategy is not easy. Which is exactly why most startups struggle in the early stages of development. It is no rocket science that you need to create products focused on satisfying your customers’ needs. Still, only 50% of US startups survive beyond the fifth year. The other half fails to exist because they make a common mistake. They develop products in isolation rather than together with their users. Personally, I support the idea of going on the market before you think you are 100% ready. However, you cannot refrain from having a connection with your customers. You have to do that before magic can happen. In fact, according to research, this is the reason why most tech start-ups fail. They create products that customers are not willing to use or pay for. So, if you’re aiming for a long-lasting company, do not make the same mistake. Learn from your customers. Focus on their feedback from day one. This is where customer support becomes very important. 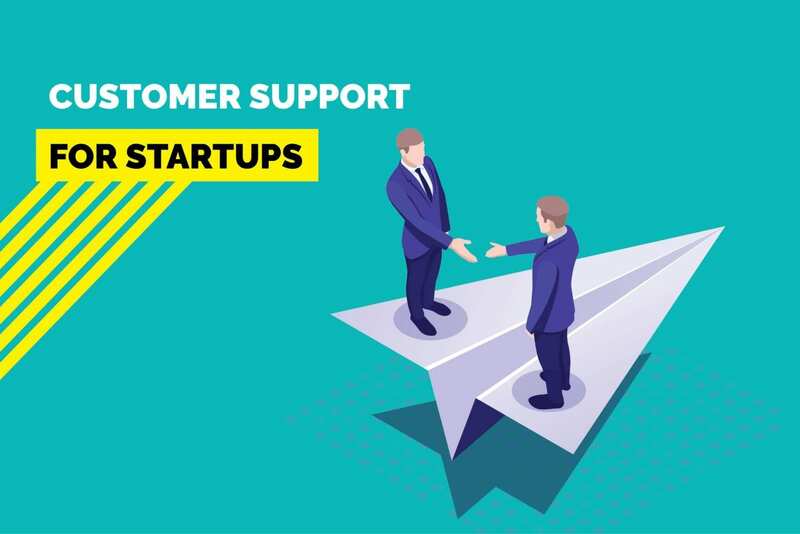 In this post, we will be discussing why startups should focus on customer support from the start itself and how to efficiently scale customer support for your startup. Before we jump into the crux of the topic, let’s quickly look at the necessities of launching a startup. Every company needs to validate their product-market fit to go further in the product development phase. But what does it mean? Let’s take a look at the pyramid below. The bottom two layers are corresponding to the market; people you want to create value for and their underserved needs. 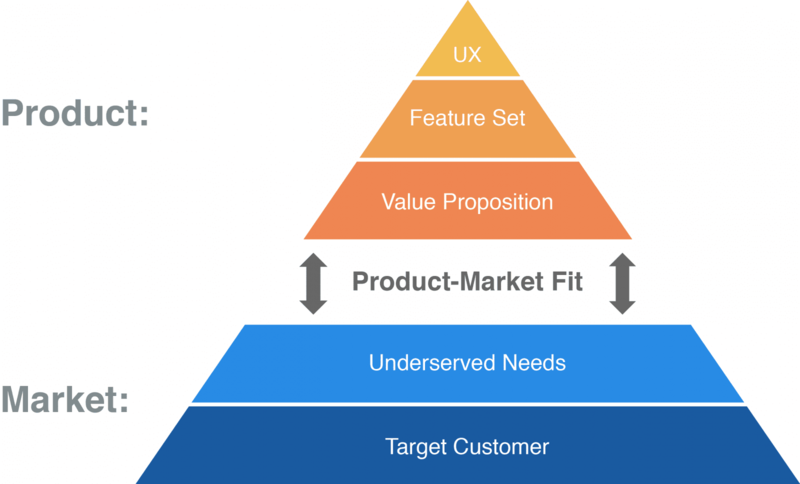 The top three layers are related to your product, which unmet value you will deliver to the customer, which functionalities your product will have and how your customers will be interacting with your product. You see, the product-market fit is how well your product decisions resonate with the realities of the market. You need to validate the fit by testing your product with your customers before you launch. However, it doesn’t mean you cannot enter the market before you are dead certain people would pay for your product. Particularly if you are disrupting the market with your innovative solution, and do not require high capital investments, the best choice is going to the market as fast as you can. In this way, you can gather valuable feedback from early adopters, people who buy new products before anyone else. An excellent tool for gathering such feedback is the main principle of the Lean Startup concept, Build-Measure-Learn. This concept is a feedback loop which helps you to take timely action when things go wrong. This way, you learn from your mistakes and turn failures into positive adjustments. As a result, you can effectively improve your products and services based on what your customers want. To use this tool, you first need to build a minimum viable product (MVP) which accommodates all essential functionalities of your product. Next, you give it to your customers to test. Then, measure the results to gather data about how well you met the customers’ expectations. Eventually, you use your learnings to improve your MVP and start the testing process from the beginning. As you might imagine, you go on with this cycle until your product/service meets the market’s needs. 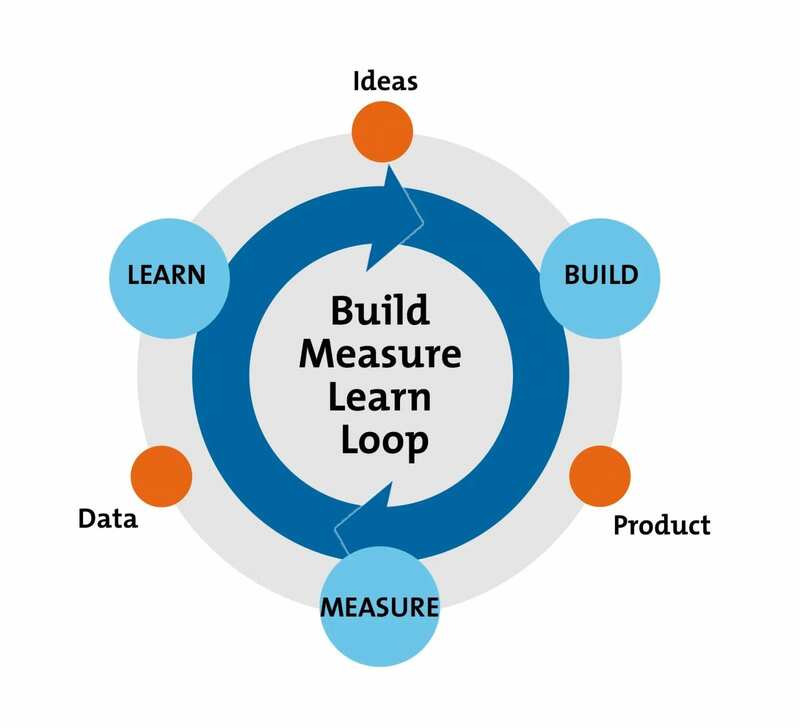 Build-Measure-Learn is an amazing tool to use when you propose a disruptive innovative product. However, if your startup is focusing on solving a problem that has been tackled before, you could take a rather straightforward approach to gather feedback. 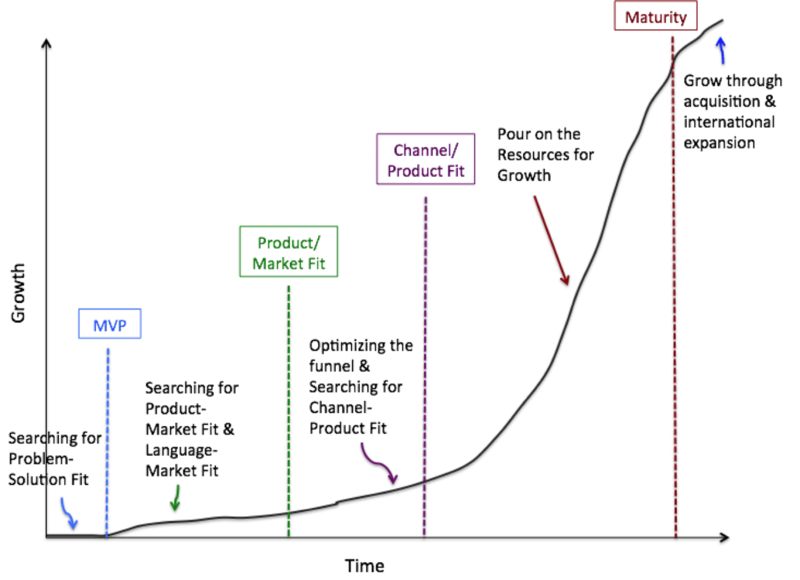 Take a look at the chart below showing a startup’s lifecycle. You will notice that the phases until the product-market fit could be a lot shorter in this case. When your startup is based on solving an existing problem, you already have a good idea of your customers’ pains. You may know what other features they would like to have in your offering to be satisfied. Understanding the needs is what makes these phases shorter. But remember, just because you think you know the market’s needs doesn’t mean you won’t require the users’ input! You should always be aware of your customers’ broader vision of how they would use your product and what adjustments they would like you to do. How to do that? By providing support, of course. Initiate contact and involve them in the process. Allow them to help you steer the wheel; change product features and the company’s direction accordingly. The purpose of a startup is to generate innovative solutions that better prevalent business operations and the way people live. Honestly, you would be wasting your resources if you develop a product that does not satisfy users’ needs. Let alone how you’d miss a chance of creating something of real value for our society. Fret not, though, you can avoid all these by listening to your customers. 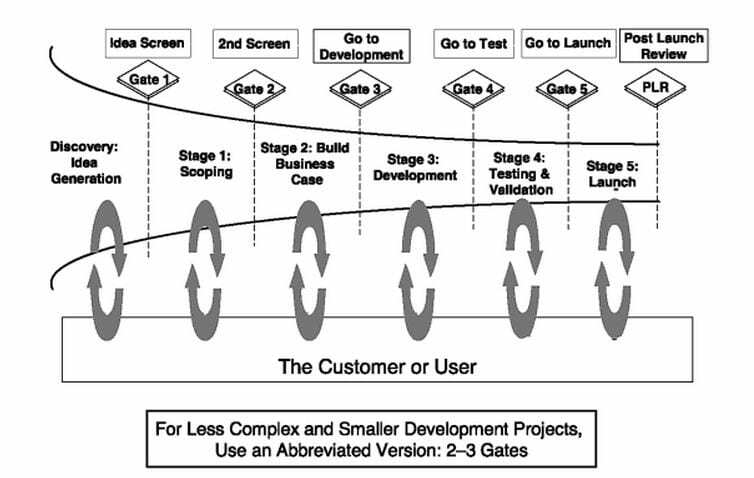 The image below shows Stage-Gate new product development process from idea generation to product launch. The model asks you to perform certain activities in each stage and collect deliverables at the gates. You should carry out these to go further in the development process. For me, the most important part of the model is the feedback loops. They remind you to receive user feedback and update your offerings continuously. Iterations are your friend in the development process. They help you better your product. That is why you need to be open to change along the way. Although it may sound harsh, the first idea you work on might not be “the one”. Take Slack as an example. It began as a communication tool for game developers. Over time, it has developed into a messaging platform for teams of all kinds. Similarly, Printfection started as a B2C e-commerce platform for artists to sell t-shirt designs to consumers. Soon after Printfection realized that the platform was, in fact, used by businesses that wanted to get their brand out in the hands of their fans. That is why they pivoted their business strategy from B2C to B2B and satisfied the customer needs. As you can see, learning from your customers will move your business forward. The more you listen to them and make adjustments accordingly, the quicker you will become inveterate in the market. Alternatively, it will help you exit the market before spending a fortune if you realize there is no market for your product. In which case, you certainly learned a lot in the process to succeed with your next startup! You never lose. When you are growing your startup one customer at a time, it is important that you keep your existing customers you worked so hard to acquire in the first place. Mainly because gaining new customers is a lot more expensive than obtaining new ones. We are talking about somewhere between 5 to 25 times more expensive! Hence, to retain your customers, you must focus on keeping them happy. But, without providing excellent experiences, you cannot make them stick around in the long run. And without customer retention, your business cannot grow. There are many tools you can use to find out how happy your customers are with your product and how likely they would promote it to others. One example would be the Net Promoter Score. This tool is based on a scale ranging from 1 to 10. Customers rating your service up to 6 are categorized as dissatisfied and pose a threat to your company. By contrast, those who give 9 or 10 are natural promoters of your business. They are the ones giving you 5 stars and promoting you online and offline. Love them from the bottom of your heart! To make sure you score high, you need to collaborate with your customers early on. This way, they will feel appreciated, become loyal relations and reward you with their honest feedback. You will then have a chance to improve your products using their feedback. Even if they were dissatisfied with you in the beginning, they no longer would stay that way. Learn more about how to get qualitative feedback from customers here. Customer support has a prominent influence on your company’s growth potential. When you make your customers happy, and they become your natural promoters, you get the most reliable and powerful form of advertising: word of mouth marketing. Startups find it especially attractive since it is the cheapest way to gain new customers and grow rapidly. Providing superior customer support separates you from your competitors. It is an important factor if you plan to stay in business for many years. You might face two scenarios when you enter the market. One, the market is already saturated with many companies providing similar products or services. So, why should people choose your company over millions of others? Two, the market is not saturated, so there is still a significant amount of demand. If this is the case, as the opportunity is there, more and more companies will become aware of it and enter the market. Soon enough it will get saturated. In our world where switching costs are decreasing day by day, only those who care about their customers will prevail. 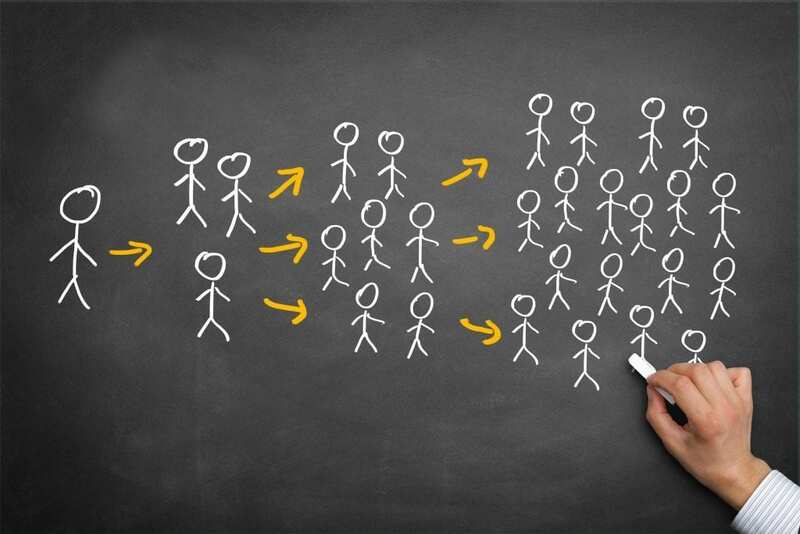 How can you make sure your customers choose you and don’t switch to your competitors? The answer is by building long-term relationships. You must be creating an emotional bond between your brand and your customers. In this way, it will raise the bar for new entrants, making it a lot harder for them to break the relationship you have with your customers. Doesn’t it sound like such a gem? Competitive advantage all the way. Make your customers feel connected and heard whenever you are in contact with them. Write thoughtful emails, empathize with them over the phone. Only then can you build a unique brand personality they can identify with. Make customer centricity a core value that is shared and supported by every employee in your company. Everyone should have the role to help customers in whichever way possible. Take responsibility for your actions, even when you make a mistake. Make use of diverse social media channels to connect with your customers. Listen to what they are saying and take every single chance to create value for them. You can ease their pain by solving their problems or simply appreciating their feedback in a friendly (and maybe witty) voice works wonders too! Even though you probably don’t have enough resources to start with, give customer support the priority it deserves. See it as an investment you make for your company’s future. You know by now it will pay off over time, don’t you? Remember, Slack was criticized for having 5 times more support staff than its sales representatives. But in the end, this was probably the reason for their rapid and successful growth: from launch to $1 billion in just over a year. It is now worth more than $7.1 billion. Keep surprising your customers. For example, answer the newest emails first instead of starting from the oldest. If people have already waited 12 hours, they wouldn’t mind waiting a bit more, as long as they receive a satisfying answer. On the other hand, if you reply to your customer in 5 minutes after receiving their email, this would create a “wow” experience and make them remember you. Give it a go next time. Here is the detailed guide to deliver great customer experience. Customers would like to have the possibility to contact you as soon as possible when they’ve got problems. This is, of course, easier to do when you have a handful of customers as a startup. But, how can you achieve this throughout your journey? Read on for some tools and techniques you can use to scale your customer support as your business grows. As the number of your customers grows along with your company, you will need to scale your customer support to meet their needs. The strategies you use in the startup phase will no longer be enough to keep up with everything. You will need smart strategies to scale your customer support and level up to “customer service” and then to “customer success” over time. You see, there are different terms used for providing customer experience. We will touch upon them shortly in the following. So far we have tackled customer support, which is a reactive way of solving your customers’ issues. It means that it was your customers who initiated the contact by calling or writing to you to ask a question. It is essential to master this level and provide a functional experience for your customers along the way. Think about having long phone calls or chats, or writing personalized emails and social media messages. This is the first step to surviving in the market. As you grow, you need to shift to being more proactive and finding ways to solve issues before they arise. This type of support is called customer service and it merely means that your business starts to initiate contact with your customers. For instance, you could ask them how they like your product and whether you could do something to make them happier. This way, instead of them coming to you with problems, you take the initiative and figure out what created dissatisfaction. The third level towards customer experience excellence is called customer success. It is an approach that is proactive in a larger scale than customer service and almost fully automated in providing support. 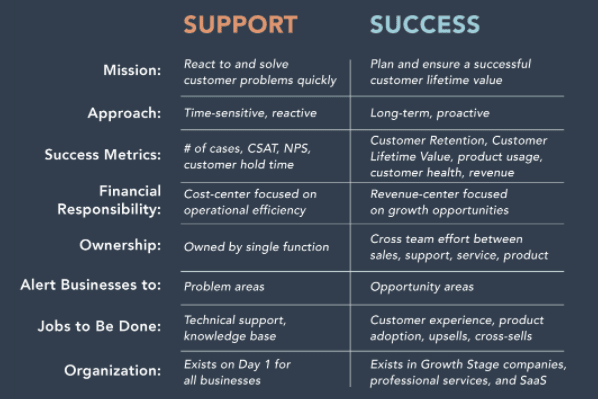 The chart below shows the main differences between customer support and customer success. You know it’s time to establish customer success when you feel you mastered customer support. Alternatively, you have just completed a milestone in your company’s growth and would like to take things to the next level. So, How to Scale the Support? To scale the customer support, make sure you use chatbots. AI-enhanced customer service is the future: many companies have been using (or planning to use) chatbots to assist their customers. The fact that chatbots are available 24/7 to provide instant support makes them very attractive. Because they ensure a high level of customer satisfaction and leave you to focusing on more important requests, implementing chatbots should be a high priority on your to-do list. On the flipside, we know that chatbots are not (yet!) able to answer each and every inquiry. If the problems go beyond the chatbots’ abilities, you can create a ticket. The best is to use the best of both humans and chatbots. Using a ticketing system (such as Kommunicate’s Mailbox, Zendesk, or Freshdesk), you can gather all incoming customer support requests in one place. You have then the possibility to manage them smartly by prioritizing important/urgent tasks. The best thing about it is that you can keep track of all requests no matter which channel they come from: email, chat, or social media. Being organized like that ensures responding to all issues, and it helps you find the main pain points. Learning from these, you can create a knowledge base for frequently asked questions (FAQ) to decrease the time and energy you spend answering each person. More importantly, you can quickly provide your customers with the information they need and make them happy. It goes without saying that your support team must handle the tickets well. You just need to make sure you are hiring the right support staff for your company. As a growing startup, value quality over quantity. Choose those who have the desire and talent to help others, who create a motivational environment for other employees to do the same. Customer support is so much more than answering questions or solving problems. It is your ticket to success. A great competitive advantage you may say. An excellent opportunity for you to learn and grow by creating a close connection with your customers, and yes, building customer loyalty. Depending on your resources, you can start by providing the support yourself and scale your way up to building a skilled team/an automated system to do it for you. Seda is a digital marketing enthusiast, who is specialized in innovation and entrepreneurship. Currently managing digital content at Wiredelta, she enjoys educating, inspiring, and communicating with people through posts she is writing. Whenever she is not at work, you can find her either at the gym working out or in her kitchen creating healthy plant-based recipes, taking photos of her food and sharing her story on her Instagram account “healthyveganseda”.